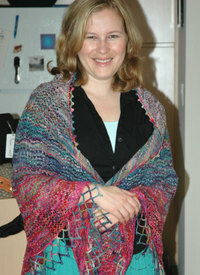 Emily finally received her Birthday Koigu shawl yesterday. She looked amazing in it, and as a coincidence was wearing a skirt that totally went with it. 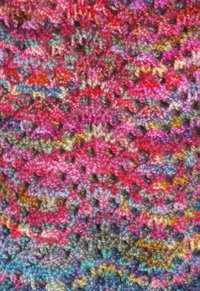 Here are some other close-up shots - one of the fringe detail, the other of the lace stitch. Down to the final colour. Can't wait to finish. I love the cast-off - the whole thing opens up like a butterfly. The final emergence is the blocking. Once the yarn hits the water you can almost hear the sigh as it relaxes. So close. And I wonder where Bel gets her love of rainbows. Hmmmm. 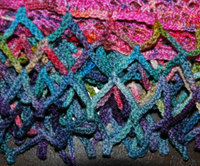 Hi Bel - thought you might like to see the progress on the shawl I'm knitting for you. Here you can see 4 colourways, although there are a couple of rows of the 5th colour. The pattern is a floral design in the shape of bellflowers - so cool. Stan calls it the 'sunset shawl'. Sixth colour yet to come. I love working on this.